Push Your Luck Podcast: Too many Cinderellas - or can I pass my cat off to the prince? Too many Cinderellas - or can I pass my cat off to the prince? Yes that's a cat with a wig. Yes you can marry the cat off to the Prince! 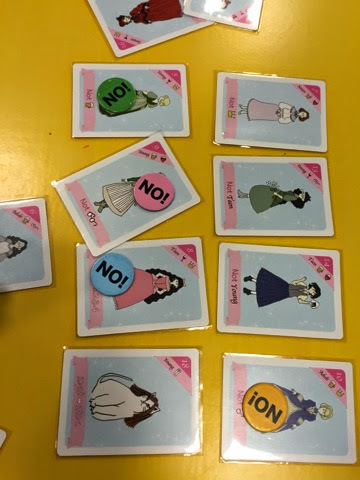 Released in 2014 by Taikikennai Games and soon to be distributed by Grail Games, Too Many Cinderellas pits 2-4 players in an attempt to marry off one of their charges to the befuddled Prince. At the start of the game, players are dealt 4 cards each and have 2 chits, a OK and a NO chit. The cards contain different characters and they have ranks 1-18 as well as certain attributes that distinguishes them. In addition, they have conditions. During a player's turn, they are to play a card from their hand face up on the table. When that happens, the character on the card no longer becomes relevant and players are focused on the condition. Players then get to choose one of their chits face down and then reveal them simultaneously. Any NO chits are placed on the card which means the condition is null and void. If there are none, then the condition is active until the end of the game. The game ends when every player has placed 2 cards at which point, they will choose 1 card from their remaining 2 and reveal simultaneously. The player whose chosen card best matches the conditions depicted by the face up cards on the table wins the game. If there is a tie, the rank that is the highest (smallest number) will win the game. This game was first introduced to me by Jonathan and it is a simple elegant little game. The premise is very simple as players are trying to ensure the conditions they play do not screw themselves and at the same time play the best conditions to give them the best chances to win. Now it definitely pays if you consult the list of characteristics so as to better play conditions that will be the most effective in eliminating your opponents' charges. However, knowing WHEN to play the NO chit is also important. It does seem now that holding it back at least until everyone had played a card is wisest. In addition, knowing when to play the conditions is important. You can play a dummy condition card first and then play the more critical one later on once everyone's NO chit had been used. Lastly, it is very amusing when people who got the Cat card tries to marry her to the prince. There are also some cards that are clearly male and when they end up marrying the prince, it is really funny. Now this is a simple micro game so do not expect anything very heavy. Most rounds will last 10 minutes or so but as a filler it fits the bill well. Easy to pick up and play, I can heartily recommend this game. Do check it out when it is released by Grail Games. Many thanks to Grail Games for the review copy!